Early in the year, I visited an eatery serving typical mainland Chinese food which I enjoyed due to its authenticity and its gastronomic revelation (read blog). But more importantly, I managed to savor a culinary import that has become a delight for foodies for me – Xiao Long Bao or Soup Dumpling. So, when I got wind that another establishment had opened up serving this steamed bundles, I knew I had to go off my usual trek into the hinterland, at least for me, to have a bite of their offerings. 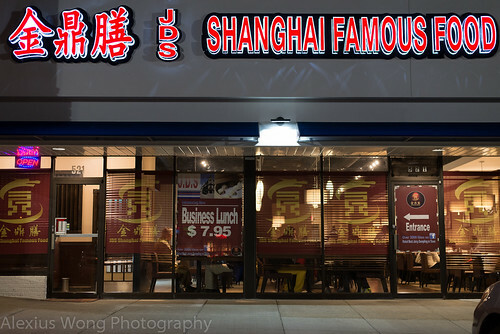 JDS Shanghai Famous Food is located in Gaithersburg, MD, an area not quite known for exotic cuisine, compared to the closer suburbs like Rockville where the aforementioned restaurant is located. But due to the expansion of the suburbs and burgeoning immigrant communities, places like this have popped up to cater to the needs of such segments of population. Thus, I walked into JDS Shanghai (its full name is way too long and quite presumptuous) with a longtime friend living in that area for dinner recently. The space is rather modern with clean lines and lots of space between booths and tables. Perusing the menu was a bit daunting since there were many dish categories with a number of offerings in each. But we came here for mainly one item – Xiao Long Bao. The menu lists three kinds of stuffing: Pork, Shrimp and Pork, and the latter mix with Okra added to it – we chose the second type. The bamboo basket arrived with 8 dumplings exuding their steamy heat when the lid was removed. 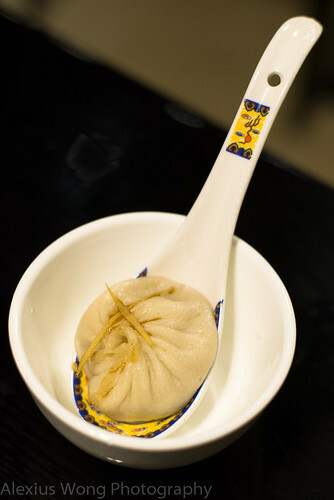 Just like the other place mentioned above, the dumplings looked perfectly round with delicate pleats as their crown. We waited a few minutes while I took a couple of photos and let them cool down a bit. One bite into them revealed their true nature. The outer wrapping was a fairly light and spongy skin that was not too thick or starchy, strong enough to hold in the soup and the meat/crab filling (some broke easily when we waited until the end to finish them). The soup produced from the melted gelatin was just the right amount for the diner to taste without overwhelming the experience. What I liked most about this version is the seafood sweetness from the crab that was subtle yet present in the whole mix, with a hint of ginger to mask any extraneous seafood flavors, this being a common Chinese pairing. The young ginger and black vinegar sauce is a must-have seasoning with these dumplings, providing the root bite and an acidic foil to these rich mouth-sticking bundles. However, when tasting the vinegar by itself, it exuded a tannin note that was borderline metallic and a bit of a letdown; obviously, the vinegar was lacking in quality. But with such tasty and well-made dumplings, I was satisfied with this order, and I will definitely have to try the version with okra in the filling. To balance off the meaty delights, we went to the ocean, not literally, but in the menu – Salt Pepper Shrimp. A long plate arrived with pieces of large shrimp neatly stacked together with a heaping of accouterments. One bite into the seafood brought a smile to my mouth. The shrimp had a light coating of rice flour batter, and it was crispy from a good high-heat frying, yet brittle enough to be consumed whole with shell intact with the flesh still quite moist and non-rubbery. The seasoning was just right with the salt although I couldn’t detect much in the pepper department. The toppings added more flavor with the softened onion and garlic, as well as the sweet red and vegetal green peppers. The sprinkling of fried vermicelli noodles added more crunch to each bite which I was thoroughly enjoying. This was a winning combination with very fresh seafood (and large pieces) cooked perfectly with the right seasoning, and the portion was generous to boot. 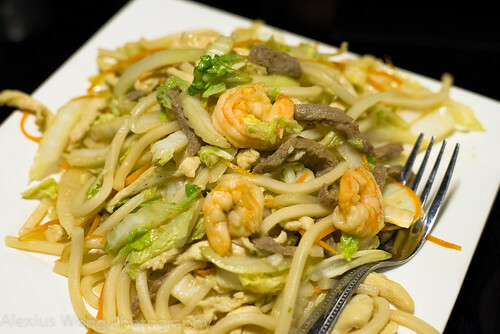 For the final dish, we ordered Shanghai Style Pan Fried Noodles. Again, the portion was rather large and it was the first dish to arrive from the kitchen after only a short wait – hmmm. One mouthful of the dish left me a bit nonplussed. The seasoning was quite lacking not just in the salt content but also in the wok flavor, an indication that this dish was hastily cooked or the wok was not hot enough. The bits of Napa cabbage, shrimp, and beef were adequate but rather bland. We managed to avoid abandoning this dish with a help of some soy sauce (strangely, none at the table) and chili oil, as well as the al dente udon-like thick noodles that provided some good body and firm bite to each forkful. Interestingly, my check came with this dish listed as Pan Fried Udon, which is not listed on the menu. Although this visit cannot be representative of this new Chinese eatery due to the few dishes that I ordered on a single trip, I must say that this place peaked my interest, as well as the crowd of Chinese customers who arrived near the end of the meal that drove the din level close to stratosphere. Never mind the misstep with the Fried Noodles. What I came here for is the Soup Dumpling that I thoroughly enjoyed with the right combination of wrapping skin thinness and the ginger-spiked crab/pork mixture. 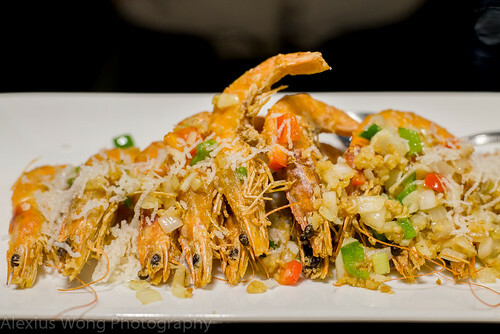 Yes, I will probably throw in the order of Salt Pepper Shrimp that won me over on this trip with the wonderful crispy shells protecting the sweet fresh flesh, topped by the textural and tasty toppings (4 t’s in a row – wow!). 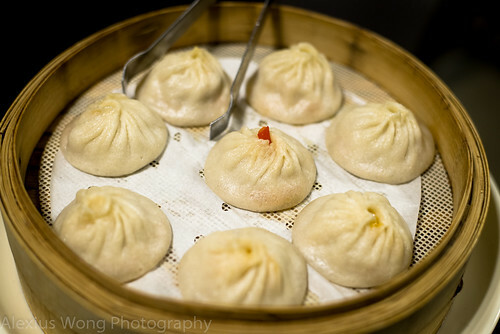 So, when I am in the mood for Xiao Long Bao and not wanting to deal with the long lines and packed space in the other place in Rockville, I will be heading here to Gaithersburg instead.